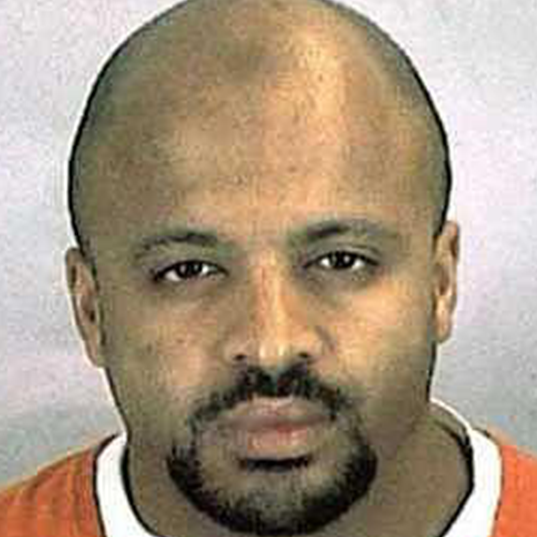 Zacarias Moussaoui is a convicted member of al-Qaeda and the alleged, would-be 20th hijacker in the 9/11 terror plot. Moussaoui was arrested on August 16, 2001, almost a month before the attacks on September 11, 2001. He was tried and convicted of conspiracy charges and was sentenced to life in prison in 2006.“Moussaoui formally sentenced, still defiant,” NBC News, May 4, 2006, http://www.nbcnews.com/id/12615601/ns/us_news-security/t/moussaoui-formally-sentenced-still-defiant/#.WUFcCGgrJEY. Moussaoui is currently imprisoned in a maximum-security prison in Colorado.Jerry Markon and Timothy Dwyer, “Jurors Reject Death Penalty For Moussaoui,” Washington Post, May 4, 2006, http://www.washingtonpost.com/wp-dyn/content/article/2006/05/03/AR2006050300324.html. “Zacarias Moussaoui Fast Facts,” CNN, last updated June 12, 2017, http://www.cnn.com/2013/04/03/us/zacarias-moussaoui-fast-facts/index.html. While in the United Kingdom, Moussaoui reportedly frequented mosques with suspected ties to al-Qaeda, such as one where U.N.-sanctioned terrorist Abu Hamza al-Masri served as a prayer leader.“Indictment of Zacarias Moussaoui,” U.S. Department of Justice, December 11, 2001, https://www.justice.gov/archives/ag/indictment-zacarias-moussaoui. During this time, Moussaoui also traveled to Afghanistan to attend an al-Qaeda training camp.National Commission on Terrorist Attacks upon the United States, Thomas H. Kean, and Lee Hamilton. 2004. The 9/11 Commission report: final report of the National Commission on Terrorist Attacks upon the United States. (Washington, D.C.): 275-6, http://govinfo.library.unt.edu/911/report/911Report.pdf. According to his indictment, he was present at the Khalden camp in Afghanistan, an al-Qaeda-affiliated training facility, in April of 1998.“Indictment of Zacarias Moussaoui,” U.S. Department of Justice, December 11, 2001, https://www.justice.gov/archives/ag/indictment-zacarias-moussaoui. According to the 9/11 Commission, 9/11 architect Khalid Sheikh Mohammed (KSM) sent Moussaoui to Malaysia in the fall of 2000 to enroll in flight training there, but Moussaoui was unable to find a school that he liked and instead began working on other terrorist plots. KSM instructed him to return to Pakistan and to attend flight training in the United States instead. Moussaoui returned to London in October of 2000, and began sending inquiries to a flight school in the United States.National Commission on Terrorist Attacks upon the United States, Thomas H. Kean, and Lee Hamilton. 2004. The 9/11 Commission report: final report of the National Commission on Terrorist Attacks upon the United States. (Washington, D.C.): 225, http://govinfo.library.unt.edu/911/report/911Report.pdf. Moussaoui is suspected to have made a second trip to Afghanistan via Pakistan in late 2000. He departed England for Pakistan on December 9, 2000, returning on February 7, 2001.“Indictment of Zacarias Moussaoui,” U.S. Department of Justice, December 11, 2001, https://www.justice.gov/archives/ag/indictment-zacarias-moussaoui. After returning from Pakistan in February 2001, Moussaoui traveled to the United States under the Visa Waiver Program, which allows citizens of select countries, including France, to enter the United States for up to 90 days without a visa.“A Review of the FBI’s Handling of Intelligence Information Related to the September 1 Attacks: Chapter Four: The FBI’s Investigation of Zacarias Moussaoui,” Office of the Inspector General, November 2004, https://oig.justice.gov/special/s0606/chapter4.htm. After arriving in the United States at Chicago, Moussaoui enrolled in a beginner flight course at the Airman Flight School in Norman, Oklahoma.“A Review of the FBI’s Handling of Intelligence Information Related to the September 1 Attacks: Chapter Four: The FBI’s Investigation of Zacarias Moussaoui,” Office of the Inspector General, November 2004, https://oig.justice.gov/special/s0606/chapter4.htm. He stopped attending his course in May 2001, but remained in the United States after his allotted 90-day legal stay.“A Review of the FBI’s Handling of Intelligence Information Related to the September 1 Attacks: Chapter Four: The FBI’s Investigation of Zacarias Moussaoui,” Office of the Inspector General, November 2004, https://oig.justice.gov/special/s0606/chapter4.htm. According to the 9/11 Commission, he was a very inexperienced pilot at this point, having undergone only about 50 hours of flight time and no solo flights. Nonetheless, he began making inquiries about flight materials and simulator training for Boeing 747s. On July 10, he made a deposit of $1,500 for a flight simulator training course at the Pan Am International Flight Academy in Eagan, Minnesota. Soon after, he received a schedule for training between August 13 and August 20.National Commission on Terrorist Attacks upon the United States, Thomas H. Kean, and Lee Hamilton. 2004. The 9/11 Commission report: final report of the National Commission on Terrorist Attacks upon the United States. (Washington, D.C.): 246-7, http://govinfo.library.unt.edu/911/report/911Report.pdf. The course was designed for experienced pilots who already had commercial licenses.“A Review of the FBI’s Handling of Intelligence Information Related to the September 1 Attacks: Chapter Four: The FBI’s Investigation of Zacarias Moussaoui,” Office of the Inspector General, November 2004, https://oig.justice.gov/special/s0606/chapter4.htm. “Zacarias Moussaoui Fast Facts,” CNN, last updated June 12, 2017, http://www.cnn.com/2013/04/03/us/zacarias-moussaoui-fast-facts/index.html. On August 10, 2001, Moussaoui drove from Oklahoma to Minnesota. Three days later, he paid $6,800 in cash to Pan Am for his flight simulator training. His conduct––including the cash payment and lack of experience––raised suspicious. While the typical student in Pan Am training held a commercial pilot license, was employed by an airline, and had several thousand flight hours, Moussaoui claimed that he had no intention of becoming a commercial pilot and instead said that he wanted to learn to “take off and land” planes because it was an “ego boosting thing.” Furthermore, he specifically asked to fly a simulated flight from London’s Heathrow Airport to New York’s JFK airport.National Commission on Terrorist Attacks upon the United States, Thomas H. Kean, and Lee Hamilton. 2004. The 9/11 Commission report: final report of the National Commission on Terrorist Attacks upon the United States. (Washington, D.C.): 247, 273, 540, http://govinfo.library.unt.edu/911/report/911Report.pdf. His instructor became suspicious and reported him to the FBI’s Minneapolis Field Office on August 15.“A Review of the FBI’s Handling of Intelligence Information Related to the September 1 Attacks: Chapter Four: The FBI’s Investigation of Zacarias Moussaoui,” Office of the Inspector General, November 2004, https://oig.justice.gov/special/s0606/chapter4.htm. On August 16, Moussaoui was arrested by the U.S. Immigration and Naturalization Service (INS) on immigration charges, as he had outstayed his legal stay under the Visa Waiver Program. A deportation order for Moussaoui was signed on August 17.National Commission on Terrorist Attacks upon the United States, Thomas H. Kean, and Lee Hamilton. 2004. The 9/11 Commission report: final report of the National Commission on Terrorist Attacks upon the United States. (Washington, D.C.): 247, http://govinfo.library.unt.edu/911/report/911Report.pdf. During an investigation, the FBI quickly realized that Moussaoui held fundamentalist beliefs. He also behaved suspiciously in other ways, such as reacting strongly to questions about materials in his laptop and about his membership in a group.“A Review of the FBI’s Handling of Intelligence Information Related to the September 1 Attacks: Chapter Four: The FBI’s Investigation of Zacarias Moussaoui,” Office of the Inspector General, November 2004, https://oig.justice.gov/special/s0606/chapter4.htm. According to the 9/11 Commission, he became “agitated” when he was questioned regarding his religious beliefs, and when asked about his travels to Pakistan. He said he planned to receive martial arts training and purchase a GPS, and could not provide an explanation for the $32,000 in his bank account. After the investigation, a FBI agent concluded that Moussaoui was “an Islamist extremist preparing for some future act in furtherance of radical fundamentalist goals,” and even concluded that he might be planning to hijack a plane.National Commission on Terrorist Attacks upon the United States, Thomas H. Kean, and Lee Hamilton. 2004. The 9/11 Commission report: final report of the National Commission on Terrorist Attacks upon the United States. (Washington, D.C.): 273-4, http://govinfo.library.unt.edu/911/report/911Report.pdf. At the time of his arrest, Moussaoui possessed two knives, flight manuals and software programs for a Boeing 747, fighting gloves and shin guards, and a computer disk regarding the use of aerial pesticides.“Indictment of Zacarias Moussaoui,” U.S. Department of Justice, December 11, 2001, https://www.justice.gov/archives/ag/indictment-zacarias-moussaoui. Nonetheless, FBI headquarters in Washington deemed there to be insufficient probable cause to obtain a criminal warrant to search Moussaoui’s laptop, so Minneapolis agents sought to prove that Moussaoui was acting as an agent of a foreign power, contacting authorities in France and Britain throughout August and early September. At one point, a CIA message to the British government even described Moussaoui as a possible “suicide hijacker.” French authorities were able to reveal a connection between Moussaoui and a rebel leader in Chechnya, but this was still not enough to obtain a warrant.National Commission on Terrorist Attacks upon the United States, Thomas H. Kean, and Lee Hamilton. 2004. The 9/11 Commission report: final report of the National Commission on Terrorist Attacks upon the United States. (Washington, D.C.): 274, http://govinfo.library.unt.edu/911/report/911Report.pdf. After 9/11, authorities moved Moussaoui to New York and held him as a material witness.“Timeline: The Case Against Zacarias Moussaoui,” NPR, May 3, 2006, http://www.npr.org/templates/story/story.php?storyId=5243788. On September 13, British authorities received information that Moussaoui had attended an al-Qaeda training camp in Afghanistan.National Commission on Terrorist Attacks upon the United States, Thomas H. Kean, and Lee Hamilton. 2004. The 9/11 Commission report: final report of the National Commission on Terrorist Attacks upon the United States. (Washington, D.C.): 275-6, http://govinfo.library.unt.edu/911/report/911Report.pdf. Additionally, after the attacks, authorities found that he possessed bin al-Shibh’s contact information and discovered that he had received funds from bin al-Shibh.Sarah Downey, “Who Is Zacarias Moussaoui?” NBC News, December 14, 2001, http://www.nbcnews.com/id/3067363/t/who-zacarias-moussaoui/#.WUFWZWgrJEZ. The 9/11 Commission believes that the 9/11 plot could have been uncovered had authorities investigated further and discovered Moussaoui’s communications with bin al-Shibh before the attacks.National Commission on Terrorist Attacks upon the United States, Thomas H. Kean, and Lee Hamilton. 2004. The 9/11 Commission report: final report of the National Commission on Terrorist Attacks upon the United States. (Washington, D.C.): 276, http://govinfo.library.unt.edu/911/report/911Report.pdf. The Commission concluded, “FBI headquarters [did] not recognize the significance of the information regarding Moussaoui’s training and beliefs and thus [did] not take adequate action…to determining what Moussaoui might be planning.”National Commission on Terrorist Attacks upon the United States, Thomas H. Kean, and Lee Hamilton. 2004. The 9/11 Commission report: final report of the National Commission on Terrorist Attacks upon the United States. (Washington, D.C.): 356, http://govinfo.library.unt.edu/911/report/911Report.pdf. On December 11, 2001, Moussaoui was indicted by a federal judge on six conspiracy accounts.“Timeline: The Case Against Zacarias Moussaoui,” NPR, May 3, 2006, http://www.npr.org/templates/story/story.php?storyId=5243788. The charges, as listed on the indictment published by the U.S. Department of Justice, included conspiracy to commit acts of terrorism transcending national boundaries, conspiracy to commit aircraft piracy, conspiracy to destroy aircraft, conspiracy to use weapons of mass destruction, conspiracy to murder United States employees, and conspiracy to destroy property.“Indictment of Zacarias Moussaoui,” U.S. Department of Justice, December 11, 2001, https://www.justice.gov/archives/ag/indictment-zacarias-moussaoui. On December 13, Moussaoui was denied bail and moved to Alexandria, Virginia, to await trial.“Timeline: The Case Against Zacarias Moussaoui,” NPR, May 3, 2006, http://www.npr.org/templates/story/story.php?storyId=5243788. Nonetheless, in the following years, Moussaoui’s trial would face various delays and complications. “Zacarias Moussaoui Fast Facts,” CNN, last updated June 12, 2017, http://www.cnn.com/2013/04/03/us/zacarias-moussaoui-fast-facts/index.html. The prosecutors in the case sought the the death penalty for Moussaoui.“Timeline: The Case Against Zacarias Moussaoui,” NPR, May 3, 2006, http://www.npr.org/templates/story/story.php?storyId=5243788. According to NPR, Moussaoui was prone to “intemperate rants” and other unprofessional conduct throughout his trial.“Timeline: The Case Against Zacarias Moussaoui,” NPR, May 3, 2006, http://www.npr.org/templates/story/story.php?storyId=5243788. In November of 2003, Brinkema would remove Moussaoui’s right to represent himself in court, citing his unprofessional and inflammatory behavior.“Timeline: The Case Against Zacarias Moussaoui,” NPR, May 3, 2006, http://www.npr.org/templates/story/story.php?storyId=5243788. He was removed from the courtroom in February 2006 due to a disruptive outburst in which he declared, “I am al Qaeda. I am a sworn enemy.”“Zacarias Moussaoui Fast Facts,” CNN, last updated June 12, 2017, http://www.cnn.com/2013/04/03/us/zacarias-moussaoui-fast-facts/index.html. In May 2003, Moussaoui claimed that he had not been preparing for the 9/11 attacks, but for a different al-Qaeda operation. In June 2004, the 9/11 Commission concluded that Moussaoui’s precise role in the 9/11 attacks was “unclear.”“Zacarias Moussaoui Fast Facts,” CNN, last updated June 12, 2017, http://www.cnn.com/2013/04/03/us/zacarias-moussaoui-fast-facts/index.html. On April 22, 2005, Moussaoui pled guilty to all six charges against him.“Zacarias Moussaoui Fast Facts,” CNN, last updated June 12, 2017, http://www.cnn.com/2013/04/03/us/zacarias-moussaoui-fast-facts/index.html. On March 27, 2006, in a blow to his defense, Moussaoui testified that he had been training to crash a plane into the White House in a fifth attack on 9/11 with accomplices that included so-called “shoe bomber” Richard Reid. He also testified that he lied to authorities after his arrest so that the 9/11 attacks would proceed as planned. On April 3, jurors determined that Moussaoui was responsible for at least one death in the 9/11 attacks, and was therefore eligible for the death penalty.“Timeline: The Case Against Zacarias Moussaoui,” NPR, May 3, 2006, http://www.npr.org/templates/story/story.php?storyId=5243788. “Timeline: The Case Against Zacarias Moussaoui,” NPR, May 3, 2006, http://www.npr.org/templates/story/story.php?storyId=5243788. A clinical psychologist named also Xaiver Amador testified that Moussaoui’s delusions were what had led him to claim his involvement in the 9/11 attacks. Amador suggested that Moussaoui’s alleged schizophrenia may have also been the reason that he had experienced so much difficulty in his flight training.Phil Hirschkorn, “Defense experts call Moussaoui schizophrenic,” CNN, April 19, 2006, http://www.cnn.com/2006/LAW/04/19/moussaoui.trial/index.html. “Timeline: The Case Against Zacarias Moussaoui,” NPR, May 3, 2006, http://www.npr.org/templates/story/story.php?storyId=5243788. In February 2008, Moussaoui’s lawyers requested a federal appeals court to revoke Moussaoui’s guilty plea on the grounds that some of his U.S. constitutional rights had been violated during the trial. However, this appeal was rejected in January 2010, and the 4th Circuit U.S. Court of Appeals reaffirmed Moussaoui’s guilt and life sentence.“Zacarias Moussaoui Fast Facts,” CNN, last updated June 12, 2017, http://www.cnn.com/2013/04/03/us/zacarias-moussaoui-fast-facts/index.html. While in prison, Moussaoui wrote multiple letters to courts claiming that he had inside knowledge about al-Qaeda, asking to testify in terrorism-related lawsuits, and making various other demands.Curt Anderson, “’20th hijacker’ Zacarias Moussaoui seeks transfer to Guantanamo,” Miami Herald, December 10, 2014, http://www.miamiherald.com/news/nation-world/world/americas/guantanamo/article4409077.html. Moussaoui wrote two handwritten letters that were filed in federal court in November 2014. In these letters, he claimed that while taking flying lessons in Oklahoma, Saudi royalty gave him money to fund the 9/11 plot. He also claimed that he had been privy to a Saudi plot to shoot down Air Force One in order to assassinate former U.S. president Bill Clinton and his wife, Hillary Clinton, on a visit to the United Kingdom.Kristina Sgueglia and Deborah Feyerick, “9/11 terrorist Zacarias Moussaoui claims Saudi involvement,” CNN, November 18, 2014, http://www.cnn.com/2014/11/17/world/zacarias-moussaoui-saudi-arabia/index.html. In December 2014, he wrote two letters to a federal judge in south Florida requesting a transfer to the Guantanamo Bay military prison in Cuba on the grounds that he was being harassed by other inmates, including Ramzi Yousef, mastermind of the 1993 World Trade Center bombing, at his maximum-security prison in Colorado. He signed the letters as the “so-called 20th hijacker” and “Slave to Allah.”Curt Anderson, “’20th hijacker’ Zacarias Moussaoui seeks transfer to Guantanamo,” Miami Herald, December 10, 2014, http://www.miamiherald.com/news/nation-world/world/americas/guantanamo/article4409077.html. “About the 9/11 war crimes trial,” Miami Herald, May 15, 2017, http://www.miamiherald.com/news/nation-world/world/americas/guantanamo/article1928877.html. In response, the Royal Embassy of Saudi Arabia distributed a press release claiming that there was no factual basis for Moussaoui’s claims. The release stated that the 9/11 Commission cleared Saudi Arabia of any wrongdoing and that Moussaoui was a “deranged criminal.”“Saudi Embassy Dismisses Moussaoui’s Allegations,” Royal Embassy of Saudi Arabia, February 3, 2015, https://www.saudiembassy.net/saudi-embassy-dismisses-moussaouis-allegations. In January 2017, Moussaoui again wrote Pohl, stating that he would be willing to testify in the 9/11 trial, even if it meant that he would be incriminated with the death penalty. Edward MacMahon, a former defense attorney for Moussaoui, has speculated that Moussaoui wrote letters and asked to testify not out of any true desire to help but rather because “he would like to be in the spotlight and is bored in solitary.”Carol Rosenberg, “’20th hijacker’ wants to testify at Guantanamo’s 9/11 trial,” Miami Herald, March 23, 2017, http://www.miamiherald.com/news/nation-world/world/americas/guantanamo/article140400503.html. Shaqil“Indictment of Zacarias Moussaoui,” U.S. Department of Justice, December 11, 2001, https://www.justice.gov/archives/ag/indictment-zacarias-moussaoui. Abu Khalid al Sahrawi“Indictment of Zacarias Moussaoui,” U.S. Department of Justice, December 11, 2001, https://www.justice.gov/archives/ag/indictment-zacarias-moussaoui. Zacarias Moussaoui is a convicted member of al-Qaeda and the alleged, would-be 20th hijacker in the 9/11 terror plot. 08/16/2001: conspiracy, terrorism charges et al. “God save Osama bin Laden — you will never get him.”“Moussaoui formally sentenced, still defiant,” NBC News, May 4, 2006, http://www.nbcnews.com/id/12615601/ns/us_news-security/t/moussaoui-formally-sentenced-still-defiant/#.WUFcCGgrJEY. “I just wish it could have gone on the 12th, the 13th, the 14th, the 15th, the 16th, the 17th.”Phil Hirschkor, “Moussaoui: ‘No remorse’ for 9/11,” CNN, April 14, 2006, http://www.cnn.com/2006/LAW/04/13/moussaoui.trial/index.html?_s=PM:LAW. Prosecutor: “You would do it again tomorrow, Mr. Moussaoui?” Moussaoui: “Today.”Phil Hirschkor, “Moussaoui: ‘No remorse’ for 9/11,” CNN, April 14, 2006, http://www.cnn.com/2006/LAW/04/13/moussaoui.trial/index.html?_s=PM:LAW. “We wanted to inflict pain on this country. I wish there would be more pain.”Phil Hirschkor, “Moussaoui: ‘No remorse’ for 9/11,” CNN, April 14, 2006, http://www.cnn.com/2006/LAW/04/13/moussaoui.trial/index.html?_s=PM:LAW. “I am al Qaeda. I am a sworn enemy.”“Zacarias Moussaoui Fast Facts,” CNN, last updated June 12, 2017, http://www.cnn.com/2013/04/03/us/zacarias-moussaoui-fast-facts/index.html. “I pray to Allah…for the destruction of the Jewish people and states and for the liberation of Palestine by the Muslim…for the return of the Islamic Emirates of Afghanistan and the destruction of the United States of America.”Josh Meyer, “Moussaoui speech shocks courtroom,” Chicago Tribune, April 23, 2002, http://articles.chicagotribune.com/2002-04-23/news/0204230290_1_volumes-of-government-evidence-jewish-people-and-states-overly-bright-cell.